During the Special Media event yesterday Apple introduced the all new iPad Pro. We already shared how much we love the new form factor, blazing speed of the new A9X processor, performance boosting GPU, and integrated quad speaker system. However, to say this announcement caught most of us a little off-guard is an understatement. It’s not that we weren’t expecting a jumbo size iPad. We heard the rumor mill churning all summer like everyone else. We fully anticipated that Apple would make an announcement some time this summer or early fall. What caught us by surprise was how much we were blown away after watching the keynote. More accurately — how much we tried to convince ourselves we needed an iPad Pro in our lives! At its core, the iPad Pro is still an iPad — an iPad on steroids, but an iPad nonetheless. So what makes this new model so appealing to both current and potentially new iPad owners? Simply put, we think it’s the sum of its parts, especially the two new accessories Apple designed specifically for the iPad Pro. 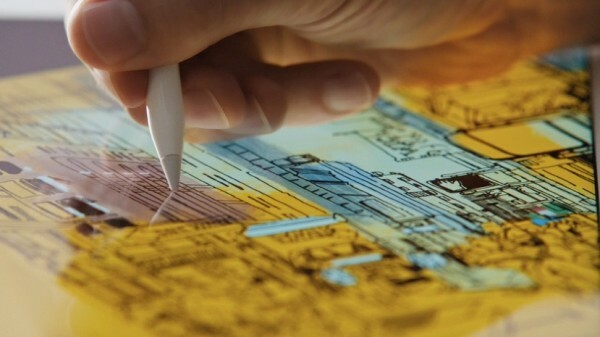 Right now let’s focus on the Apple Pencil and what functionality it adds to the user experience. What makes the Apple Pencil experience unique? The touch sub-system of the iPad Pro display had to be re-engineered to measure both finger and stylus input on the same plane with optimal accuracy — something that is typical not very easy to do. Many stylus note-taking apps solve this problem by adjusting the area that your hand rests on as to not receive inaccurate or unintentional input. 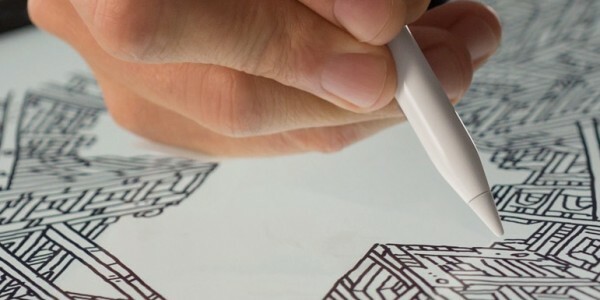 However, the Apple Pencil uses highly responsive sensors located at its tip to detect the position, force and tilt of the Pencil when in contact with the iPad Pro surface. The low latency of the Apple Pencil makes for an almost immediately responsive writing and drawing experience. The iPad Pro can detect whether you’re using your Apple Pencil or one of your fingers — and reacts differently to each circumstance. When the iPad Pro surface senses an Apple Pencil additional subsystems scan it 240 times per second. In doing so, twice as many data points are detected than what is normally found with your finger. Sensors in the Apple Pencil can determine with extreme accuracy whether you are pressing down gently or not, and when you choose to apply additional downward force it responds by drawing thicker lines. Additionally, you can change the angle at which the Apple Pencil comes in contact with the multitouch display of the iPad Pro to create a shading affect in limitless varieties. At the opposite end of the tip is a hidden charger kept covered with a magnetic cap. This Lightning connector will allow you to charge your Apple Pencil by plugging it right into your iPad Pro — even if it is within a case. Amazingly, you don’t need to leave your Apple Pencil plugged in to long to be up and running again, as it will only take 15 measly seconds to provide enough additional charge to last another 30 minutes! When your are done using your Apple Pencil, though, you can allow it to charge fully which will provide you with 12 hours worth of use. You can pick up your new Apple Pencil for $99 sometime in November. Thanks for your comment–My guess is that we “might” see the Apple Pencil integration with other iPad’s, but I’m not sure how integrating that tech into the smaller screens will add to the cost. 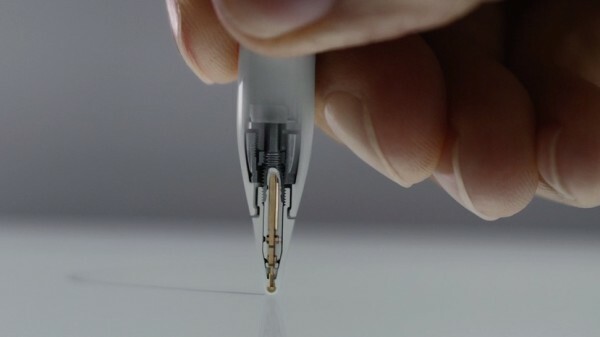 The Apple Pencil only works as well as it does because of the specialized touch sub-system they developed for the iPad Pro. And since they are marketing this Pro device they way they are, for artists, engineers, doctors, and other professionals, I can also see them keeping it tied to just the iPad Pro. Since we didn’t see any update of the iPad Air line and the iPad mini 4 had no mention of compatibility, we prob wouldn’t see anything new until summer/fall 2016–but who knows for sure.